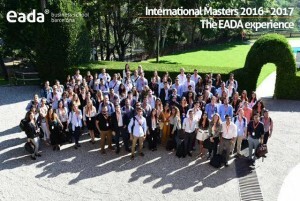 In line with EADA’s goal to encourage networking and connecting students to local and international business, our International Master participants started out the year with opening presentations that took place in landmark companies spread across Barcelona. The presentation of the finance programmes (International Master in Finance, International Master in Accounting and Financial Management the Master Internacional en Finanzas – Bilingüe) took place in the Banc Sabadell Tower, Bank Sabadell was founded in 1881 and represents one of the largest baking groups in Spain. According to Jaume Bonet, director of the finance programmes, “This presentation represents and tries to communicate a closer relationship between EADA and the real professional world. This is reinforced with company visits and professional conferences along the programme.